When one’s eyes are closed and the focus is on only one of the senses, it’s like arriving at the station of Something Great and the experience is much more powerful. You start to feel the warm vocal harmonies, arbitrary pop melodies, moving rhythms and a strong presence. Behind the name The Hearing is Helsinkian musician Ringa Manner. A daydreamer, romantic, nerd, rocker and music enthusiast, you name it! Izabell makes melodic hip hop and is known for her laidback flow over heavy bass beats. In 2014 she debuted with the single "Ka vet du" and it included on the soundtrack of the film Haram. She's been named the country's best female rapper by NRK P3. In 2015 she released her debut EP "Honning & Aske". She has also participated in the big collaboration hit "Attitudeproblem" with Silvana Imam, Bendik, Julie Bergan, Stella Mwangi, Christine. In the summer of 2017, Staffan Lindström from Åland Islands released his self-produced debut album "Du sköna nya värld" under his artist name Bromander. Popmuzik wrote "The result is beautiful summer pop with a hint of 70's fragrance", about the single "Vargata kroken". With lyrics and music about hope and despair, Bromander creates his very own musical universe that touches the audience. Roxy Jules is balancing on a knife edge between something very fragile and porous with something very noisy and confronting. The songs are revolving around distorted guitars, electronic drums, eerie keys and Julie Runa’s intriguing vocal and lyrics. Roxy Jules challenges the listeners with musical complexity where contrasts constantly are fighting against each other. Behind the name Roxy Jules you find Danish musician, singer and composer Julie Runa. Her sound has been decribed as a love child of The Kills and PJ Harvey. The music speaks a language of its very own and shows how beauty and raw power can interact in the best possible way. Shivan Dragn is the solo outfit of Artturi Taira, a Helsinki-based composer, producer and musician. After unsuccessful attempts to become a jazz saxophonist, Taira first started writing his own pop songs & toured the world with his now-defunct band Rubik, then began producing other Finnish artists from underground to mainstream (Ruusut, Pariisin Kevät, Jaakko Aukusti, to name a few). As Shivan Dragn, his multi-layered, electro-acoustic sound ventures somewhere in between experimental contemporary pop, dark side balearic and hypnotic, stabby hissing. To date, and stubbornly so, the music of Shivan Dragn only exists in live format. Surf-garage from Malmö is bascially what Toi Let is about. The previous trio, now quartet, offers a sound that swings between bold and poppy, noise and precision! "The Essential ToiLet" was released on Rundgång Rekords in 2017 - and is just as the name suggests: a collection album. If you have not pleased your eyes and ears on witnessing Toi Let before - then we are suggest you to not miss this chance! Gärigheter is a creative platform focusing on building relationships with open minded and forward thinking companies who wants to open doors for the next generation of creative heads. The female collective work hard on including minorities in their fight for a better and more sustainable future. "Music is a universal language. It’s identity. It brings us hope, joy, sadness and sometimes it’s even used as a way to survive. It creates memories but most of all it brings human beings together and for us, it feels just as important as breathing. Expect a broad mix of all hiphop genres and a mix of future-beats with bailefunk. With both new releases, classics and underground they promise to create a music experience like no other." OAS1 is when Anton breaks free & plays solo from his duo OAS. Everything started on a treadmill in Lillehammer, Norway and a great song on the headphones. The thought of the bad music that was always played at the club made him even more sweaty. The DJ career was a fact - someone has to take responsibility! DJ Iggy Popeda (presented by Creat) takes you on a musical trip around the planet and into the unknown. He has played at a tango festival in Norway, street food market in Helsinki, silent movie club in Stockholm – even at an opening party of a pedestrian tunnel in Iisalmi. Now in Kökar he will be spinning carefully selected vinyl records just for you - enjoy the ride! In this workshop we're off for an architectural treasury on Kökar! We'll spend the week looking for interesting deserted structures and landscapes. Can we find a potential reuse of some of the abandoned buildings on Kökar? Can we find a new way to read any of the forgotten landscapes on the islands? By the week we'll hear several inspirings lectures, and we'll test our own skills as restructuring architects. The workshop will give a playful introduction to some basic architectural tools, involving work with hands, body and mind. The workshop is led by architects Marina Bauer (Åland) and Karoline Kalstveit (Norway), two of three partners in the Norwegian based architecture firm OPAFORM. Marina has led a Norwegian national project that transforms abandoned agricultural buildings into spectacular tourist-destinations. Whereas Karoline has won awards for her investigation of Unstad, a small village in the Lofoten archipelago, striving to adapt to it's new status as a tourist- and surfing-destination. If you get a spot in the workshop, note there will be a fee of 80€. Fee includes camping, festivalticket and participation in workshop. Gabriella Riddez's art examines contrasts and subtle elements of the social contract. She challenges perfectionism by incorporating small elements of skew in every work. All works carry a story, but she wants the viewer to make her own. Founder and creative leader of the separatist art agency Femart.se. Philosophy student, musician and part time worker in health care. He's one third of the band Birdpeople, which also appears as a sprawling group in thoughts and sounds. The impulse of the present work is an acute claustrophobia for Edmund Husserl's phenomenology. The most fantastic technique in art, to Aino, is watercoloring, and of all the places in the world she loves Kökar the most. She used to live in Kökar from June to October during 28 years, during those years she also held summer courses in watercoloring at Kökar. Elisa Serafia is a visual artist based in Helsinki, Finland. She paints abstract and colorful paintings. Serafia's art expresses strong emotions and forces. Serafia uses acrylics, pigments and spraypaints on canvas. She gets inspiration from her visions, dreams and nature. She loves water, pisces and neon colors. Minna gets inspired by street art and random found items. Her technique varies depending on time, space and idea. Femart is Swedens first and only art agency with and by female and non-binary artistis. They convey norm critical and social reflective art. Artist living on the island called Föglö, in the Ålandic archipelago. Often portrays human relations in three-dimensional objects. Annas art is exhibited at Församlingshemmet in Hamnö. Anna will be there and show her art during Saturday 25th of August between 12.30-14.00. Regine Neumann was born in Germany and is now living in Canada. She sees her work as a dialogue with nature and time and with the situations, the places, and the people she encounters. Her installations have been realized during several nature or environmental art projects and residencies in Canada, Japan, Taiwan and Germany, and for a second time now in Kökar. Regines art installation can be found on the road from Kökar harbor to the festival site. Elisa is born in Tampere, Finland. Her form of art is painting and drawing. She has studied art in the Art school, eg in Suomenlinna/ Helsinki and in the Institute of Fine Arts in Helsinki. She moved to Kökar in November 2017 and is now working in Satu Kiljunens artstudio in Kökar. A big inspiration in her art expression is Kökar. Elisa will keep the art studio open on Saturday 25th of August between 12.30-14.00. *With reservations for changes in program. Note! Only cash is excepted when buying tickets at the door. Anna Sundblom-Westerlunds exhibition in Kökar parish house. Anna is present and gives guides. Elisa Matikainen has an open gallery at Satu Kiljunens art studio in Vålö. Elisa is present and gives guides. KÖKART festival 2018 is a contemporary music and culture festival in one of the most exotic spots in the Ålandic archipelago. It is not only the most scenic and beautiful festival in this part of the world, it is also aiming to innovate future cultural mindsets for all of you who care about climate, sustainability, migration and the essence of life! The combo of urban lifestyle and the space and room for opportunities in the Ålandic archipelago, are a unique place for us, to offer you and the rest of the world as an innovative “out of your comfort zone experience” with workshops, nordic food, art and of course music! Divided into 2 festival forms, the festival starts with 3 days of workshops and ending with 2 days of concerts. That means that you actually have the chance of spending 5 days at KÖKART festival. Of course you can choose just the music part of the festival if that is what you are craving for. The festival theme is the 4 elements earth, air, water and fire and we promise that these elements are very present during your stay on Kökar - a small archipelago island southeast of main island of Åland. KÖKART festival is powered by Nordic Institute on Åland in cooperation with the local Kökar community and funded by Nordic and local support. Nordic Institute on Åland (NIPÅ) is a cultural institution under Nordic Council of Ministers. Bus from Stockholm (City Terminalen) to either Kapellskär/Grisslehamn harbor. Ferry from either Kapellskär/Grisslehamn harbor to either Mariehamn/Eckerö harbor. Bus from either Mariehamn/Eckerö harbor to Långnäs harbor. Ferry from Långnäs harbor to Kökar. *Galtby is situated in Korpo, approximately 75 km from Turku, passing Parainen (Pargas) and Nauvo (Nagu) on the mainland of Finland. To get to Korpo there are two smaller cable ferries, which both operates according to a timetable. Expect at least 4½ h driving time from Helsinki to Galtby. Camping is included in your ticket, but you need to reserve your spot – Do it here! Be part of the first year of KÖKART festival and ensure your ticket now - it's easy! All tickets include camping and access to the festival area. Please note: Bring your own tent. Grab the opportunity to visit the beautiful Åland Islands archipelago and join us in creating the very first KÖKART festival 2018! By volunteering at KÖKART you have the chance to get to know people around the world, enjoy the nature in Kökar and be a member of our festival production team. Anyone can volunteer - as long as you are older than 18 years! Volunteers will work with us on the island of Kökar which is situated quite exactly in between Åland Islands and Finland. We will inform you properly how the get in Kökar. Volunteers will be guided by our festival team and we aim to share the shifts so that everyone can enjoy the festival program as well. We have several options you can choose from the application form below. Volunteers need to be over 18 years and respect our festival values. We don’t expect any specific skills, but If you happen to have passion and expertise in some specific area please let us know! In addition to an unique work experience, we give you a festival ticket and food during the festival. Please fill in the application form below and we will contact you as soon as possible and latest by the end of July. The application form includes add-on information about the tasks, timing and accomodation. We take care of you and the environment! KÖKART is more than a festival, it is a meeting place for cultural dialogue and questions related sustainability. KÖKART works towards in being a pioneer as a sustainable cultural festival in the Baltic Sea and aims to leave a minimal carbon footprint. 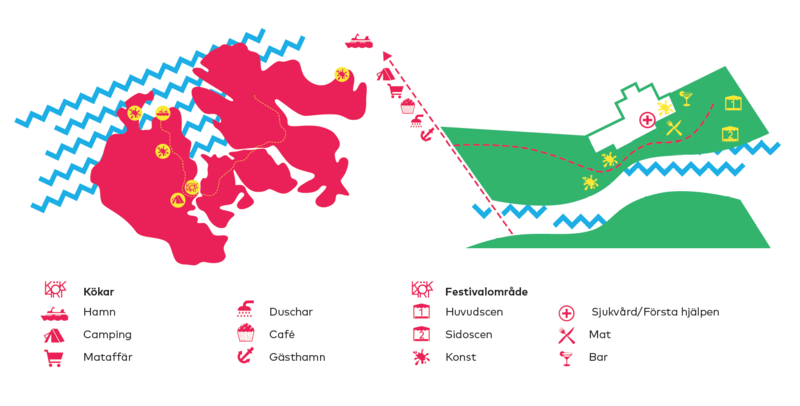 KÖKART supports locals and invites all to enjoy art, music, local food and atmosphere in the beautiful archipelago surroundings. We will work in the rural archipelago with respect. We hope you will not drive your own car at Kökar during the festival, instead the festival organizers will offer bicycles, electric bikes and electric car transports as local transport on the island. We aim that materials used during the festival are ecological, possible to re-use or has the chance be recycled. KÖKART festival is powered by Nordic Institute on Åland in cooperation with the local Kökar community and funded by nordic and local support. Nordic Institute on Åland (NIPÅ) is a cultural institution under Nordic Council of Ministers. • To be a visible active player in the Ålandic arts and culture scene and to play a leading role in relation to the Ålandic cultural interaction with the rest of the Nordic region and other prioritized geographical areas. • Contribute to children and young people having a central place in Nordic cultural cooperation. NIPÅ is an information point for Nordic Culture Point and Nordic Culture Fund. We offer guidance and help to choose the correct grant programme in the possibilities for financial support. Nordic Institute on Åland was founded in May 1985. "Contact me if you would like to be a part of the KÖKART festival. We're always interested to collaborate with creative partners." "Contact me for general information about the festival! We're are looking forward to see you at Kökar this summer!"